In one of the most notorious trials in Kansas City's history, a jury found Doctor Bennett Clark Hyde guilty of murdering Kansas City real estate developer and philanthropist "Colonel" Thomas H. Swope on May 16, 1910. Despite strong evidence linking Hyde to the crime, this verdict would be overturned by a higher court in a few months time, leaving the city to ponder whether Hyde had committed the murder. Born in Kentucky in 1827, the Yale-educated Thomas Swope speculated in mining and real estate in New York and St. Louis before moving to Kansas City at the age of 30. Once there, Swope entered into the real estate business and eventually owned more land than anyone else in the city. One of his most notable real estate ventures, known as "Swope's Addition," was located at 10th Street and Grand Avenue. Swope is best remembered today not for his real estate activities, but for his gift of Swope Park to Kansas City. 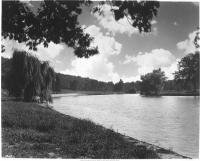 The park's expansive 1,334 acres, located adjacent to the Blue River, provided a space where eventually the city's residents could enjoy picnics, a night at Starlight Theater, trips to the Swope Park Zoo (now the Kansas City Zoo), and golfing. When the park opened in 1896, nearly 18,000 people arrived to celebrate. Nearly a hundred years ago, however, mention of the name "Swope" would instantly summon conversations about a string of mysterious deaths in the Swope family. On October 3, 1909, just two days after the unexpected death of the executor of Swope's will, Thomas Swope himself died of an apparent "cerebral hemorrhage." Two months later, typhoid fever took the life of Swope's nephew. Dr. Bennett Clark Hyde, the Swope family's physician, came under suspicion for the mysterious deaths. Dr. Hyde was the respected, but widely resented, president of the Jackson County Medical Society. He also had married Thomas Swope's niece some time before the deaths. As a confirmed bachelor, Swope had no children of his own, a fact which placed Dr. Hyde in line for a share of the inheritance of Swope's fortune of $3.5 million. Prosecuting attorney James A. Reed therefore had little trouble establishing a motive. Evidence against Dr. Hyde also seemed abundant. Investigators revealed that Hyde had purchased cyanide capsules just days before Swope's death. Surviving witnesses in the family likewise testified that Hyde had given Swope a pill just before his sudden death. Hyde had also purchased typhoid samples shortly before the outbreak of that disease in the Swope mansion. Consistent with the growing conspiracy theory, the Hyde family had avoided infection even though most of the Swope family fell ill. A jury accordingly convicted Dr. Hyde for murder on May 16, 1910. As in modern times, however, a legal defense team supported by extensive financial resources could hold a great deal of sway in court. Dr. Hyde's wife, Francis Hyde, paid for an appeals process that resulted in the overturning of the first trial's verdict by the Missouri Supreme Court. A mistrial ensued, and the jury failed to convict Hyde in a third trial. The evidence against Hyde seemed conclusive on the surface, but ultimately the courts ruled that it was merely circumstantial evidence that did not prove his guilt. After seven years of court battles, Bennett Clark Hyde was legally cleared of suspicion in the murders. Public suspicion proved harder to subdue. The trials had ruined Hyde's career, and he eventually divorced Francis Hyde. In 1934, Dr. Hyde died without ever confessing to the crimes, leaving the people of Kansas City to wonder what really happened in the Swope mansion in 1909. Biography of Thomas H. Swope (1827-1909), land developer and philanthropist, by Susan Jezak Ford. Biography of James Alexander Reed (1861-1944), attorney and politician, by Nancy J. Hulston; Reed was the prosecuting attorney in Dr. Hyde’s trial. General Hospital Profile, by Janice Lee; Swope donated the land for the hospital. Portrait of Thomas Swope, 1906. Dr. B. Clark Hyde Composite Photo. Crowd at Swope Park, 1920. Independence, MO, Swope Residence photograph. Postcard of the Swope Residence, Independence, MO. Thomas Swope Residence, 1925; located outside Independence, MO. Postcard of the Evanston Golf Club; formerly an older house owned by Thomas Swope. Kansas City, KS, Minnesota Avenue, turn of the 20th century; Thomas Swope was one of four businessmen who played a role in the founding of Wyandotte, Kansas, which was later named Kansas City, Kansas. Thomas H. Swope Swimming Pool, aerial view, 1945. Thomas H. Swope Settlement located at 1608-10 Campbell, 1930s; children in cribs. Thomas H. Swope Settlement located at 1608-10 Campbell, 1930s; a woodworking class. Postcard of 9th Sreet, West from McGee; shows the Keith & Perry Building where Dr. Hyde had an office. “Was It Murder?,” by Debra Parson, in the Jackson County Historical Society Journal, 1999. “The Verdict of History: Examining Missouri's Judicial Record,” by Debra Parson and Christyn Elley, in the Jackson County Historical Society Journal, 2000; a broad examination of major court cases in Missouri history. Vertical File: Swope, Thomas H.
James Reed Speech in Swope Murder Trial, in Great Speeches by Famous Lawyers of Southwestern U.S.A., by A.E. Montgomery, 1905. Microfilm: Native Sons Scrapbooks, Roll 57, Prominent Businessmen of 1897; includes information about Thomas Swope. Microfilm: Native Sons Scrapbooks, Roll 12, Thomas Swope; includes photographs. Quastler Photograph Collection; includes photographs of Thomas Swope and other early Kansas City leaders. Biographical sketch of John Cleary, defense attorney for Dr. Hyde, in Missouri Democracy: A History of the Party and Its Representative Members--Past and Present, 1905. Photo and bio of James Page, assistant attorney to James Reed for the prosecution, in Men of Affairs in Greater Kansas City, 1912: A Newspaper Reference Work, by the Kansas City Press Club. Murder of Thomas Swope, chapter in Cross-Examinations of Witnesses: Rules, Principles and Illustrations, by Asher L. Cornelius, pp. 408-443. Thomas Swope Murder Case; 130 pages of newspaper clippings. Susan Jezak Ford, Biography of Thomas H. Swope (1827-1909), land developer and philanthropist. Giles Fowler, Deaths on Pleasant Street: The Ghastly Enigma of Colonel Swope and Dr. Hyde (Kirksville, Mo. : Truman State University Press, 2009). Henry C. Haskell and Richard B. Fowler, City of the Future: A Narrative History of Kansas City, 1850-1950 (Kansas City, MO: F. Glenn, 1950), 96. Nancy J. Hulston, Biography of James Alexander Reed (1861-1944), attorney and politician. Kansas City Parks and Recreation Department, Brochure of Swope Park. Rick Montgomery & Shirl Kasper, Kansas City: An American Story (Kansas City, MO: Kansas City Star Books, 1999), 185.